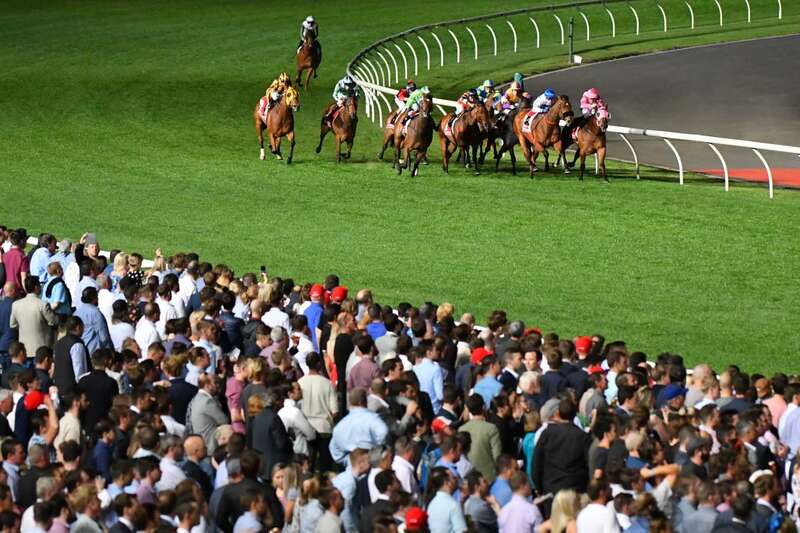 Moonee Valley plays host to Group One racing on Friday night with the running of the $ 1 million Manikato Stakes (1200m). The track is likely to be rated a Good 4 and the rail will be in the true position. The first of eight races is scheduled for 6:30pm (AEDT). Good pace here as you’d expect for a 1000m dash. Sacred Sword will probably have a look for the lead from the outside gate but Zoumanor, Heart Conquered and Final Choice will make him work. Propelle is likely to settle around midfield with cover, away from the fence. Propelle (11) went like an absolute rocket in a recent 800m jump-out at Flemington, winning by at least 10L in what was the quickest time of nine heats held that morning. She was most impressive winning at Sale two-back before pulling up lame after going under when favourite at Flemington last start. A tongue tie has been applied for her return. Sacred Sword (3) will have to jump quickly from barrier 11 to be any chance, but his first two starts suggest that he’ll do that. The McEvoy colt split a couple of handy types in Qafila and Encryptian at Caulfield on debut, before finishing 2nd as a $ 1.40 favourite at Swan Hill last start. That was his first run for 353 days so he should improve off that. Heart Conquered (2) was perhaps a little disappointing here last start but he did cover additional ground. He’s drawn for a much more economical run here. Our Long Sali (7) makes her debut for Patrick Payne after winning 3 from 6 in Tasmania. She was ridden right out when 3rd in a recent Cranbourne trial. Verdict: Propelle (11) for the win. Happy to take $ 3+. Lopartega should take up the running from out wide ahead of Perfect Rhyme and Pierrocity. Pleasuring and Qafila are likely to settle in the second half of the field. Lopartega (3) hasn’t won for a while but she loves this circuit (4:1-3-0) and should give a great sight out in front here at each-way odds. She’s bumped into the smart Our Libretto at her last couple, finding that mare just a touch too strong over the final 100m in the Pinker Pinker (2025m) at Cranbourne most recently. Pleasuring (2) finished just behind Lopartega in 3rd last start after coming from last at the 400m. The Weir mare has now had three runs back from a spell and should be nearing her peak fitness-wise. Pierrocity (8) didn’t have a lot of room in the straight last start and probably should have finished closer than 1.5L off the winner. She was a strong winner over 1400m at her Australian debut and looks suited up to this trip. It’s hard to know what to make of Nettoyer (1). She’s definitely good enough at her best but she raced like a tired horse in the G3 Craven Plate (2000m) last start. Perhaps a drop in grade and firmer deck will see her improve. Qafila (7) is another curious runner here, stepping out of her own age group for the first time and also jumping from 1600m to 2000m. Verdict: Lopartega (3) looks a good 1 x 3 play at $ 6/$ 2.10. Iconoclasm will probably jump in front from barrier two but may allow Nangawooka to cross over from wider out. Vinland should settle in the first four or five, while Widgee Turf maps to find a midfield position with cover. This looks a two-horse race between Iconoclasm (3) and Widgee Turf. The former has the advantage of early speed, which is always a bonus around this circuit. He was very impressive winning over 1400m at Caulfield last start in solid time, joining in at the 250m before putting a space on his rivals. He pulled up with a throat issue when failing here prior so put a line through that run. Widgee Turf (1) doesn’t spend too much time in the paddock but he does come into this relatively fresh (55 days between runs). He crossed the line with Hartnell in the G2 PB Lawrence Stakes (1400m) two-back before finishing a close-up 2nd to Theanswermyfriend in Adelaide. He’s unbeaten over this route and has only missed a top-two finish once in five runs here. Amadeus (5) is one to consider for trifectas from the soft inside draw. Pace from Zahspeed from the inside alley. Odeon, The Lord Mayor and Sherlock Holmes will probably push forward to look for spots in the first half of the field. Waging War will drift back from the outside gate. Tipped Waging War (4) at Group One level last start so have to stick with him here back in grade. Although he never threatened in the G1 Toorak Handicap (1600m), his last 100m was most encouraging and he appears to be crying out for this longer journey 4th-up. The major concern here is that he’ll more than likely have to circle the field from last after drawing the outside alley. The obvious danger to the top pick appears to be Odeon (2) who will settle much closer in the run. He was terrific in the G3 Naturalism Stakes over this trip two-back before just whacking away for 5th in the Herbert Power last start. The drop in distance looks suitable. Zahspeed (5) overdid it when leading over 1700m at Caulfield last start. The blinkers come off here and he can roll along at a slower tempo stepping up to 2000m. His form prior was very good and he does race well here (7:1-2-1). Weir pair Last Week (8) and Mr Garcia (1) mix their form a bit but have to be respected. Verdict: Waging War (4) for the win. Meridian Star might be able to find the front here ahead of Hay Bale and Punt Club. Written Choice will probably zoom across to look for the spot outside of the leader. It’s never easy to overcome the outside barrier in these 955m scampers but Written Choice (9) was pretty impressive winning over this route last start in 55.22. That was his first go around the Valley so there’s no reason why he can’t at least hold that level here 3rd-up. The 1.5kg weight increase isn’t much of a concern. Esperance (2) will get back from the wide gate and look to swoop home hard. He was a touch underwhelming at his first couple of starts this preparation but has bounced back in emphatic fashion, winning his last two at Warwick Farm and Randwick. Bowman is 2 from 2 on the Godolphin gelding. Punt Club’s (10) 1st-up record is average but he’s always thereabouts in these 955m races (8:2-2-0). He’ll need a slice of luck from barrier 2 but is probably over the odds at $ 23. Prezado (6) has been a bit of a disappointment since finishing 2nd to Nature Strip in the Inglis Dash back in January but his last-start effort here was his best for some time. He needs to begin better than he did there though. Verdict: Written Choice (9) for the win. Savapinski and Glenrowan Prince will probably be the first two into stride but Carlingford, Runson and Captain Punch are all capable of applying early pressure. Good Project, Isaurian and Chamois Road won’t be too far away. Waller-trained veteran Good Project (4) has been jumping out in very impression fashion at Flemington leading up to this 1st-up assignment. He takes on some smart sprinters here but is probably a touch of overs at $ 13. He didn’t really come up last preparation but was competitive against the likes of Voodoo Lad at his previous campaign. Isaurian (14) was just nosed out by Moonlover at this track/distance last start. That galloper has gone on to win again since, taking out the Listed Black Pearl (1200m) at Geelong on Wednesday. Runson (12) has developed into a pretty bombproof conveyance with an adaptable racing pattern. He made solid ground from midfield on resumption before bolting in at Cranbourne last start when sitting outside of the leader. There is strong pace in this but it’s certainly not the end of the world if Baster has to snag back for a bit of cover. Chamois Road (1) very rarely runs a bad race and has to be considered even with his big weight (61kg). Verdict: Good Project (4) is worth a bet at $ 13 if he runs up to his jump-outs. Sunlight will probably lead ahead of Invincible Star. Houtzen and Jungle Edge won’t be far away. U S Navy Flag could potentially end up on the leader’s back if he jumps quickly but it’s probably more likely that he’ll end up three-back the fence. Kementari and Spirit Of Valor will be looking to slot in around midfield from their wide draws. Good competitive race but extremely difficult. The pace looks red-hot so I’m inclined to lean to horses who are going to be strong at the end of 1200m. Kementari (2) certainly fits that mould coming off a 2nd in the G1 Memsie Stakes (1400m) and a 4th in the G1 Makybe Diva (1600m). He’s been freshened for this and will sport blinkers for the first time. The obvious concern is the wide draw and the fact he’s likely to be spotting the leaders a decent start at the 400m. U S Navy Flag (8) sunk like a stone in the wet last start but he should find this assignment much more to his liking. He’s a G1-winner over 1400m so when Sunlight and Invincible Star are taking shorter steps over the final 50m, he should be lengthening stride. Obviously he’ll need plenty of luck from the inside draw but Ryan Moore isn’t one to shy away from taking a needle-eye opening. Spright (12) is one to consider for the quaddie at huge odds. She attacked the line strongly for 3rd in the G1 Moir Stakes 1st-up and is better suited up to this distance. Her racing pattern means that she always needs absolutely everything to go right though. Spirit of Valor (6) was terrific at his Australian debut in the G2 Schillaci (1100m) last start and he does boast a 1L 2nd to Merchant Navy over this distance. The worry with him is the wide gate. Queensland mare Houtzen (10) might be the best hope of the on-pace brigade. Sunlight (14) is an absolute ripper but $ 4.40 certainly looks short enough in this field given the early pressure she’s going to have to soak up over the first 400m. Verdict: Kementari (2) on top in a very open edition of the Manikato. Sunday Pray probably leads from Downhearted and Strike Force working forward from out wide. Star Fortune maps to follow the leader from barrier 1. Tamasa should slot in around midfield, with King’s Command a length or two further back. King’s Command (1) looks value here at double-figure odds. The Corstens’ veteran loves it here at Moonee Valley (5:1-0-3) and he appears perfectly drawn in barrier 6. He’s certainly done enough in his first two starts back over 1200m to suggest he’ll be right in the finish 3rd-up over a more suitable distance of 1500m. Shokora (7) was sound behind Tulip over 1400m at Caulfield two-back before being outsprinted by some handy types at Flemington last start. This is an easier assignment but barrier 2 is far from ideal for a horse who is generally fairly sluggish into stride. Tamasa (5) has won his last couple over 1340m and 1400m. His most recent victory wasn’t exactly electric but he did enough to score and he might be looking for a touch further now at his 5th run for the campaign. Black Sail (11) is a real ‘thinker’ but he should enjoy a sweet run in transit from the middle draw.